Pirates & Privateers : On a boat which is the port and which is the starboard? 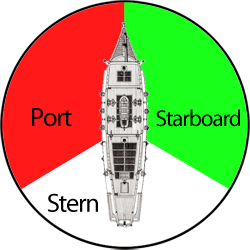 Question of renji (03.02.2016): On a boat which is the port and which is the starboard? A: The port is on the left if you are on a ship and you look toward the bow (front). Starboard is on the right. Port: This term was borrowed from the Dutch “Bakboord”, ‘bak’ meaning "back" and ‘boord’ meaning "edge". Long before the Dutch word the captain governed with an oar fixed to the right side of the boat and therefore his back to the left side. There was an alteration of the word at the “bottom border” and “basbord” and then finally “port” when the crew stood on the port side while the starboard was reserved for officers. Starboard: term borrowed from the Dutch “stierboord”, variant “Stuurboord” with ‘stuur’ meaning rudder, and ‘boord’ meaning "border". The rudder was on the right side of the ship.